Stage2 recommended a disruptive Blue Ocean strategy for an upstart airport restaurant trying to evolve an established industry. The brand is supported in their website, Request for Proposal submissions and public relations outreach. The strategy took off, it continues to support the company’s multi-decade growth and travellers now believe airport dining can be delicious. In the early 2000s, Stage2 recommended a disruptive strategy for an upstart airport restauranteur trying to break into the saturated market. The new approach highlighted their authentic street restaurant roots, celebrity chef connections, and "farm to flight" philosophy. The strategy took off and launched the company's success. All messaging was infused with Tastes on the Fly’s unique perspective at the time—a commitment to replicating the street experience on the concourse. Stage2 created marketing campaigns and proposals that tapped into the company’s street restaurant roots. 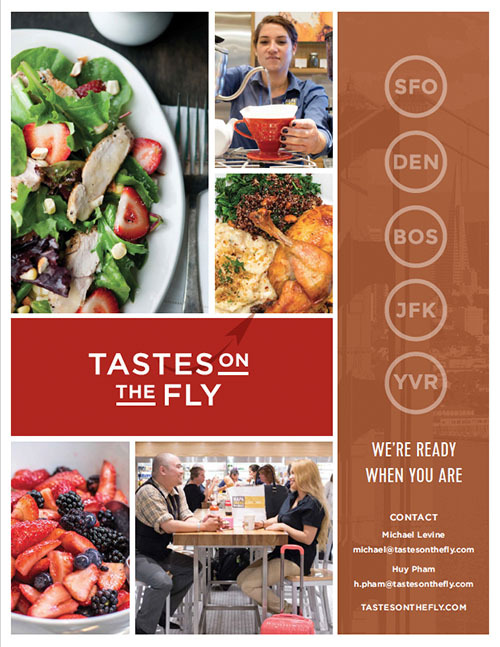 One of the Taste on the Fly properties is Napa Farms Market in SFO. They curate the best new products by artisan growers and producers from Napa Valley. Stage2 serves as their ongoing marketing director, ensuring external materials reflect the company's care, dedication and expertise. Stage2 delivers thoughtful, passionate marketing that connects big ideas to great brands. For best results: listen, be inspired, then translate ideas to action.